The most effective way to reduce fuel consumption by the vehicle equipped with internal combustion engine is to increase the number of speed ratios in the transmission. It leads to design complication and increasing the number of gear trains used. Here is proposed to make combinations of planetary gear sets and gears with fixed axles for obtaining simple designs of multi-speed transmissions with a small number of shifting elements used. The aim of the paper is to analyze compound transmission structures consisting of three simple gear trains with fixed axles and two planetary differential gear sets which forms three parallel power flows (three-stream transmissions). 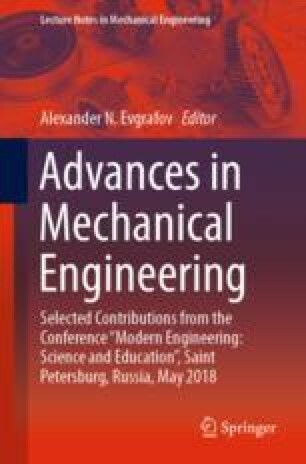 The possible structures of combined transmissions with planetary gears and gears with fixed axles are considered in the article. Such transmissions have a great perspective because of utilization simple gears and a small number of clutches, while these transmissions allow obtaining a significantly larger number of different speed ratios than the transmissions made up of the identical gears type. The possible three-stream transmissions structures were analyzed and classified, and a general expression is obtained for calculating the number of speeds in such transmission. A technique for synthesizing kinematic diagrams of transmissions with three power flows is described, using which new transmissions designs are obtained for each possible structure. The research was supported by Russian Science Foundation (project No. 17-79-10493).